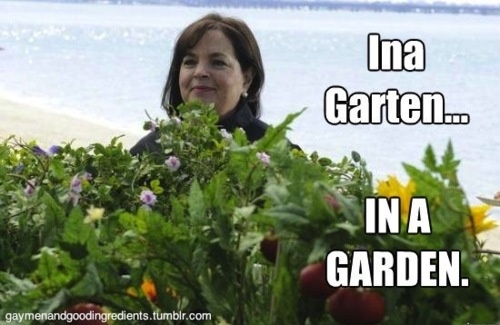 And while we’re at it, let’s applaud the Internet for giving us the “Inside the Mind of Ina Garten: Meme. LIVING! I have troubles watching Giada now, as she smiles way too much. No sane person really needs to grin euphorically as they slice an eggplant or say “ahhhhhhh!” every time she adds an ingredient that she thinks smells good. If I have to watch her zest another lemon, I might lose my mind. Thank Allah for Bitchin’ Kitchen on the Cooking Channel. Oh, my beloved readers, it is the most wonderful cooking show. 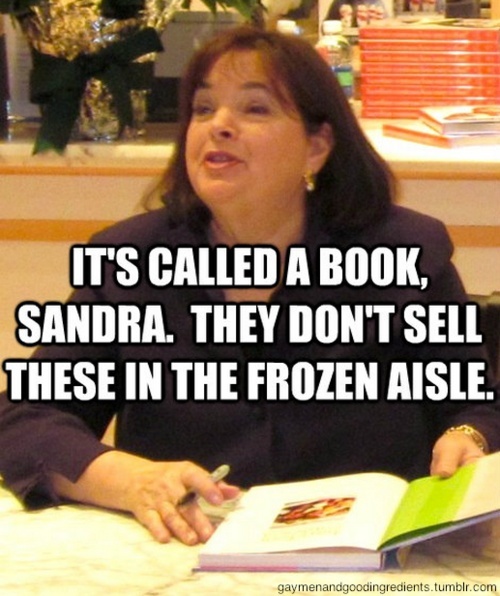 It carries on the traditional format that I so love — straightforward cooking — but turns the whole thing into a parody. You know how I feel about a good parody. Nadia, a fabulous Canadian-Italian woman in amazing heels guides us through various dishes. 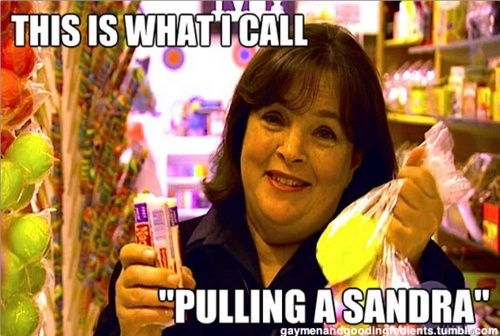 She is acerbic and irreverent and hilarious and I’m obsessed with her. For instance, in the last episode she started off by comparing hipsters to terrorists. It was perfect. I couldn’t stop laughing. 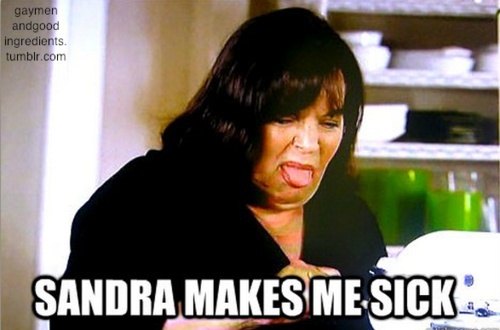 She dresses well, her food looks great, the show cracks me up, it makes the world better, and she sings! What’s not to like? Then there is a guy who never wears shirt, another who is a parody of an Italian butcher, and the spice agent, who nobody can understand. I look forward to this show every single week. It’s delightful. Watch it. Now, you nerds. <– you’ll get that later. I have never listened to much of Fantasia’s work, never really thought to, now that I think of it. I probably wouldn’t have listened to her new album, but the cover art is so striking that I couldn’t resist when I saw it on the new release section of Spotify. 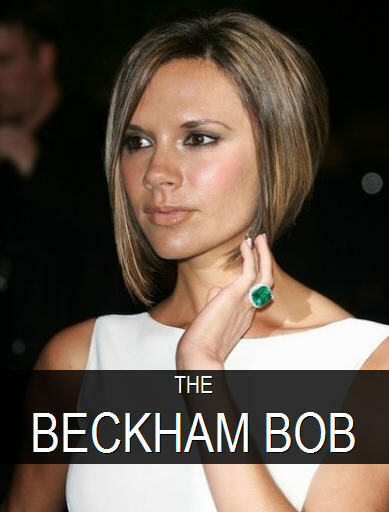 She had a bob, guys — you know how I feel about bobs. They are the perfect haircut and I think everybody should have one at some point in their life. Look at Victoria Beckhanm, she’s divine, or at Johnny Depp in Charlie and the Chocolate Factory. Bobs are exceedingly lovely. I wish I had straight hair so that I could wear my coiffure as such. Alas, I don’t. Anyway, so taken by that image, I hit play and have been listening to it ever since. I’m kind of obsessed. The songs are beautiful and well-written and the instrumentals are done perfectly. My favorite song is a bit different from the rest of the album as it has more of a hip-hop feeling, called “Without Me,” I can’t get enough of it. I listen to it all the time — when I exercise, when I brush my teeth, when I tan, when I shovel water out of my pool, when I weep as I apply aloe vera lotion, as I read, all the time. The ballads are quite good, too, the title track in particular. Do give this album a listen. Indian food is something that I never really thought I would like, but I adore it. There are so many vegetarian dishes! My favorite is palak paneer — wilted spicy spinach with fresh cheese. It is divine. I’ve had many versions of this dish, but Namaste India was the best by far. I want some now! If I lived in Des Moines, I would get Indian food for lunch every day! My father bought a Groupon here and we went with my sister — who is petrified of all food. It was surprising of her to go. For her, it was an act of extreme bravery. The ambiance is lackluster in the extreme, but the food, my dears, the food is exceptional. 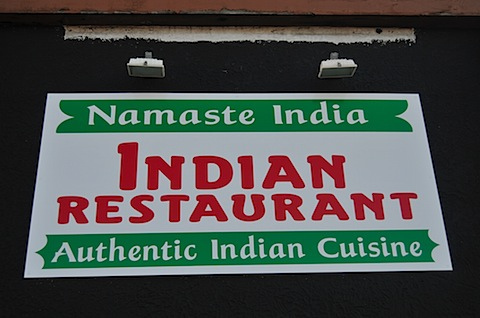 It is the best Indian food I’ve had, yet. For appetizers, we had a dish called onion pakora. This is, what appears to be, clusters of onions and spinach dipped in a batter and fried — a bit spicy, too. Dipped in one of the sauces or even without, this is one of the best things I have ever put into my mouth. It was a religious experience. We also had vegetable samosas that were very good, but not all that thrilling. For the most part, everybody enjoyed their meals and we all had a good time watching the music videos that played on the big screen televisions. Lovely place. I cannot wait to go back! I’m going to try, I forget the name — it has chickpeas, and I love me some chickpeas. Ancient Egyptian mingling with lions — it’s absolutely perfect for me. He posts things like this every day. 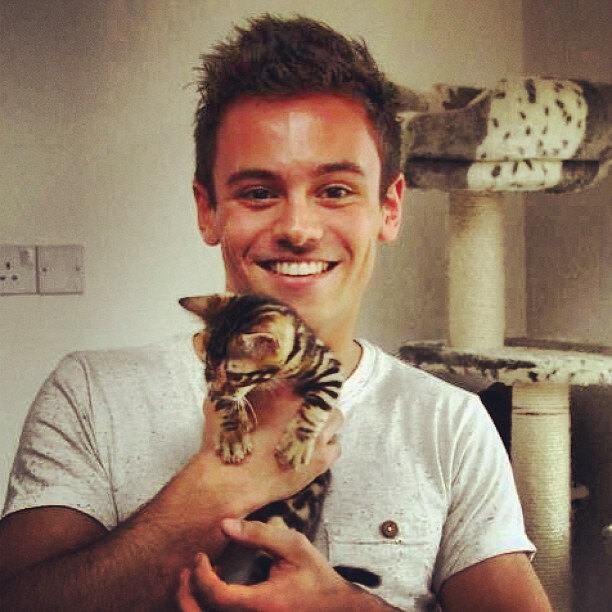 Sweet Lord Jesus. If I haven’t spoken about these delicious El Salvadorian treats before — which I’m almost sure I have — but if I have not, I’m much remiss. I don’t know if they are easy to find in your area, but here in Perry, we are blessed with a diverse Latin culture and have lots of interesting shops and restaurants. My favorite is El Buen Gusto, a rather plain restaurant painted a shade of blue that’s a bit too blue. Aesthetics get me, you know? 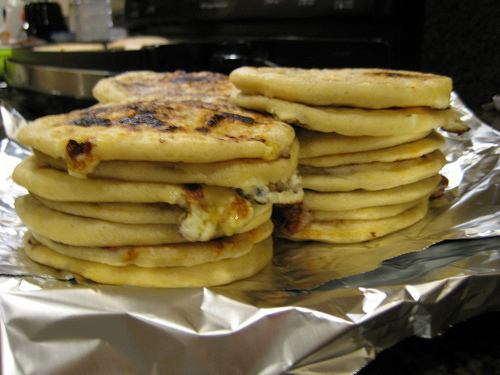 Anyway, a pupusa is basically a thick tortilla stuffed with a filling, cooked on a griddle, and then given to you to be gorged upon. My favorite is filled with cheese. Another is cheese and bean, but the cheese alone is something truly special. I had them last night and I am going to have them again tonight and I’m not ashamed. They’re not healthy, but why bother, and I don’t care. Why isn’t it five o’clock, yet? This is getting to be a crisis. How can I go to Egypt — looking like a resplendent English traveler from Victorian times — if I don’t have the perfectly tailored linen suit? Seriously. I found an image of one (see above) but for the life of me, I can’t track it down nor find one similar. I’ve looked in all the usual places, but my brands have let me down. Neither Topman nor Indochino nor Bonobos nor Macy’s has anything like what I’m looking for — they’re all too boxy. Perhaps I will have to go ask around the suit shops in Des Moines. Somebody has to have it, even if it must be custom designed. I must have a slim linen suit that I can wear on camel rides around the pyramid, as I walk around the souk, as I smoke hookas with the natives, as I climb around the Valley of the Kings and photograph every single thing in an annoyingly tourist fashion. In fact, I think it would be a crime to humanity if I didn’t have a suit like this one. People deserve to see me looking my very best. I’m not sure I can pull off a hat, though, I have an awkwardly shaped head. In marching band, I had to have the largest sized hat, it’s a family curse. Oh, did you notice the shoes? Fashion-gasm. So, I had been planning on having a tanning day on Sunday for the past week. It was going to be seventy-five degrees, absolutely beautiful, and I bought ingredients to make sidecars as I lounged in the sun. The sidecars, yes, plural, were delicious. [In a cocktail shaker, combine equal parts brandy, triple sec, and lemon juice over ice. Sip and repeat.] Looking back, I realize that this was not the best plan. Actually, it wasn’t an awful plan and I’ll surely do it again, but I wasn’t anticipating the UV to be quite so high. Perhaps I fell asleep…I did. I woke up and went for a run. I went for a bicycle ride. I ran in the garden. I went inside and gasped. I was red. I was fried. I looked like one of the dancing lobsters on The Amanda Show. 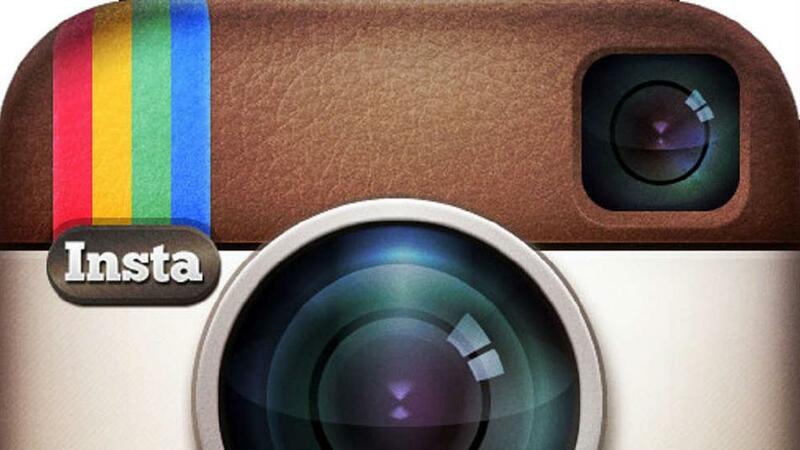 You’re all following Amanda Bynes on Twitter, right? I live for her. What’s going on? It’s amazing whatever it is. I want to run to NYC and become her best friend. We’ll stalk Drake and take selfies in our underwear. Good times. The burn was worth it for that joke, but I am in so much pain. Like, sitting at work, it is difficult for me to type because it forces my shoulders to rub against my shirt which in turn causes me to weep — but I’m holding it in. Stiff upper lip for the children, you know? I haven’t had a burn this bad in a couple years. I really shouldn’t let myself burn. I use sunscreen every day on my face and neck, but I never really think about anything else. I need to start. I hate sunscreen, though, perhaps there is a better kind that isn’t so oily and disgusting? We will have to find out. I will be severely annoyed if I die of skin cancer. I insist on having a much more interesting death. I have always been rubbish at scavenging for mushrooms. I just don’t have the eye for it unless they’re all over the place. I get better after I see one, which is odd, since I know exactly what I’m looking for, but maybe my eye needs to retrain itself? Ever since becoming a vegetarian, I have fallen in love with mushrooms. They are meaty and delicious and I want them in everything. Portobello burger — yes please! Mushroom bourguignon — gimme! 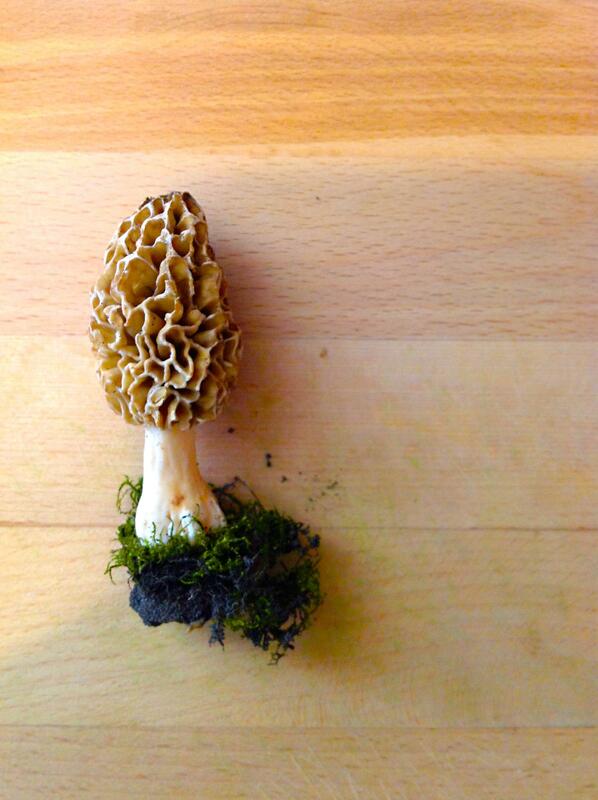 Luckily for me, we own a forest where delicious morel mushrooms pop up each spring. I always enjoyed looking for them, but would never eat them — they looked gross and weren’t all that alluring covered in butter and breadcrumbs. But, last year, I decided to start experimenting after Jose and I found hundreds in one day. Oh, it was thrilling! I made gnocchi with morels which was good, I made pappardelle with morels which was delicious, but then I made a triumph of culinary genius — a white pizza with morels. Oh sweet Muhammad. It had garlic and ricotta and fresh mozzarella and queso fresco and chives from the garden and if I recall correctly, sliced shallots. I’m craving one right now. Unfortunately, I can’t make one. I have looked and looked and looked, but there are no morels to be found. We have had an absolutely horrible winter that has lasted far too long. 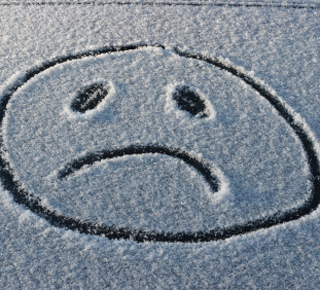 Today is the first of May and there is snow in the forecast for tomorrow. This is beyond stupid. I was tragically burnt on Sunday wearing nothing but a speedo, but now I have to wear a sweater and fear frostbite? Global warming was supposed to make everything hotter, no? So, I don’t know if or when we will get mushrooms. People elsewhere have found them, but none in Iowa. It’s a continuation of depression. I shouldn’t be all that surprised. Remember how I was tragically sunburnt — how could you forget, I just wrote about it — this weekend while lounging in my chaise with a hearty cocktail? Well, today is now Thursday and the burn has faded for the most part, leaving me with a pinkish tone that will surely fade into a stunning tan, which I’m very excited about. But, my excitement has faded. The forecast called for a couple chilly days of rain with a few flurries. Well, how those fools got it wrong again! 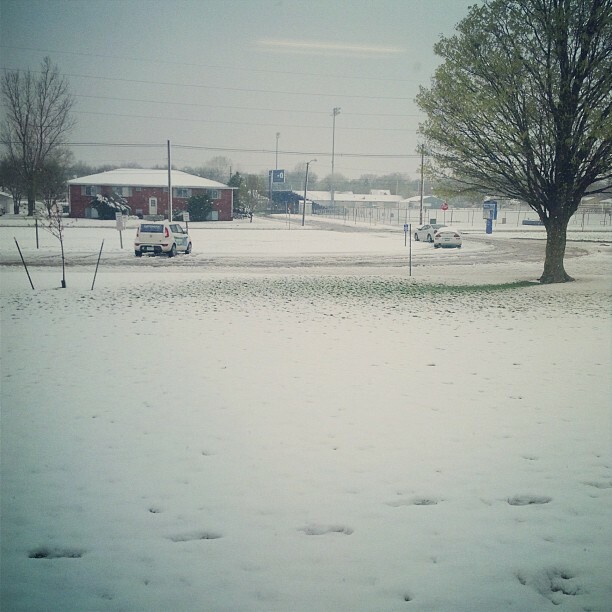 It’s basically a blizzard right now — we could barely make it in to work on the awful roads. 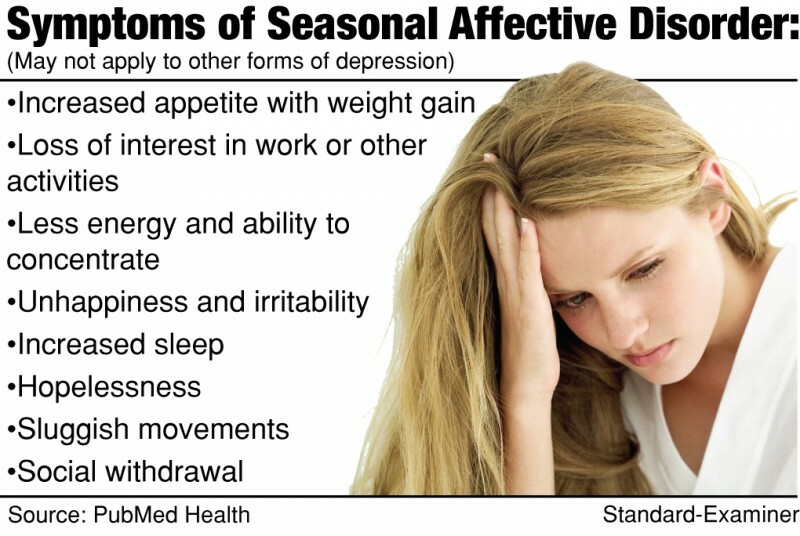 I’m so miserable, my dear readers, I about called in for depression. We haven’t been released early, yet, but if this keeps up, it will only be a matter of time. Getting out early is the only good thing to come out of a snow. UPDATE: we didn’t get out and I’m hella pissed. I put a check next to them all, how about you?